When it comes to patient reviews, many dental practices can often feel like they’re juggling with fire: When everything goes right, you’re certain to impress. But even the slightest misstep can cause some serious damage to the foundation your practice is built upon. On one hand, positive reviews help to generate valuable feedback about your practice and all of the hard work and attention to detail provided by your staff; not to mention the potential for referrals. Conversely, negative reviews can cause a lot of frustration as patients air a one-sided view of any grievance they may have with the service and care they received at your office; potentially resulting in the loss of new patients. In a world of Yelp, Angie’s List, Facebook, Twitter, and the like, dental practices can’t afford to simply ignore patient reviews, and need to actively strive to collect as many positive reviews as possible. The key to successfully managing patient reviews is to maximize the odds of receiving the type of quality reviews that help a practice grow, while properly handling any negative reviews your practice may receive. It’s part of human nature that people rather complain about a negative experience than talk about a positive one. That means patients are far more likely to leave a negative review than talk glowingly about what a great experience they had during their last appointment. In fact, surveys have found that disgruntled patients are 50 percent more likely to share their experiences on review websites than happy patients. Provide your patients with instructions. A simple handout that includes instructions on where and how to leave a positive review not only helps to encourage patient participation, it also simplifies the process. Keep copies on hand and give them out to happy patients as they leave your office. Send an email. Include a brief statement thanking them for their visit and ask that they take the time to leave a short review. Just as with the handout, make sure you provide instructions and links on where and how to leave a review. While you should use an automated service like MailChimp to send out your requests, make sure to personalize each email to the individual patient. Create incentives. A popular technique used by many dental practices is to hold a raffle or other randomized giveaway that patients can enter by leaving a positive review. Every patient who leaves a review on the platform of your choice is automatically entered to win. Make sure to choose the winner randomly, so as to avoid the appearance that leaving a better review increases a patient’s odds of winning. Use videos and photos. It’s important to keep your presence on review websites like Yelp up-to-date. Make sure your profile, logo, and office photos remain current so there’s no confusion on the patient’s part about whether they have the right practice. Respond immediately. Social media is social by its very nature. That means people want to see how businesses engage and interact whenever they leave a comment or a review. Patients will occasionally have negative things to say about your practice, but how you respond will tell everyone watching what your practice is really all about. Start by sincerely apologizing for the patient’s negative experience, and ask what you can do to help correct the situation going forward. While the issue behind the complaint will very, your open, honest, and quick response should remain consistent with every negative review. Don’t become combative. It can be tempting to share your side of the story whenever a patient leaves a negative review. However, social media and review websites are not the place to engage in a game of he said, she said. Trying to set the record straight will only come across as defensive and as your practice not owning up to any mistake in service. If you feel a patient is being unfair, ask to take the conversation offline and call them to discuss the issue personally. If you can successfully reach a compromise, ask that the patient amend their previous review to say the issue was successfully resolved. Flag the review as false. While not common, rival businesses may attempt to sabotage the competition by leaving fake reviews about poor service or treatment. However, in order for you to successfully have a fake review removed, you’ll need to prove that the person was never a patient. This can be difficult in an age of screen names that hide a patient’s true identity, but appeal processes do exist for this very reason. Have the negative review removed. While this is not an option for most reputable review websites, it is by far the most effective way of dealing with a negative review if possible. Studies and common sense show that patients are more likely to choose a dentist that carries a positive reputation online. Patients are also more willing to pay for a product or service they view as being of a higher quality. This makes reputation management a key part of successfully boosting your practice’s patient base and bottom line. 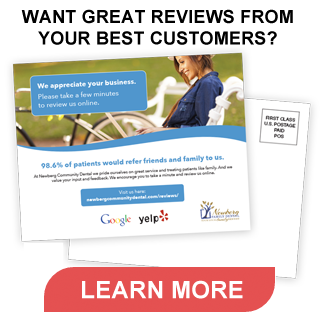 Testimonials from current patients add needed credibility to your marketing message. You can talk about being the best, but word-of-mouth marketing still matters. When your patients have nothing but great things to say about your practice, the number of referrals and new patients will only continue to grow. ← What is the Value of a Like?